ETLJB 21 November 2012 - According to a report in Jornal Independente on 20 November 2012, the Prime Minister Xanana Gusmao, as Defence and Security Minister, said that he will not tolerate young people who intend to create instability in the country when the United Nations mission finishes its mandate in December this year. 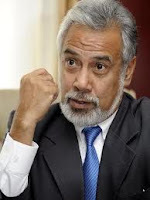 Xanana told the youth not to attack each other with stones. “If you attack each other with stones, I will order that you be arrested and that you not be fed while you are in custody,” the Prime Minister is reported to have said to journalists at the Nicolau Lobato International Airport in Dili on 19 November last after returning from his overseas visit . Speaking as the Minister for Defence and Security, he said that he did not fear being condemned for violating their human rights by ordering that those who involve themselves in problems such as assaulting or stoning each other not be fed whilst being held in custody. “I, Xanana, speaking as the Minister for Defence and Security, say that whoever makes trouble, I will order the police to arrest you, then afterwards you can scream about your human rights being violated and take me to the International Court,” Xanana is reported to have said. Xanana said that he too had heard information that some groups intended to create instability in the country after the UNMIT mission has finished. “I say, whoever is so hard headed, we will put human rights aside then we can resolve the problem. I will do this because I am thinking about your future, I am thinking of the future of the nation,” Xanana affirmed. In the meantime the PNTL Operations commander Superintendent Armando Monteiro said that the PNTL is currently in full operations throughout the country to anticipate any possibility of instability in the country. But the Police Commander, Commissioner Longuinhos Monteiro has also appealed to all local residents not to panic about rumours that people dressed as ninjas will cause security problems when the UN leaves. Suara Timor Lorosae reported yesterday that the Commissioner said that the local authorities needed to have a dialog with communities to discuss these widespread rumours that are causing fear in the population. He called on the local authorities to cooperate with the police in order to transmit factual information to the people.